The Red Cedar is an important tree in the history of Australia. Affectionately known by the Australian settlers as Red Gold, this tree was the pulling motivational factor that caused the settlement of much of the coastal and hinterland areas of the country. The industry operated through most of this century and supported the livelihood of many early settlers. Red Cedar trees are famous for their wonderful timber and for the speed at which they disappeared after European arrival. They are not so well known as fast-growing, handsome shade trees. 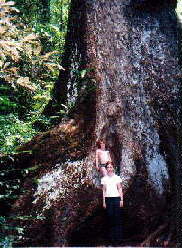 This is the largest accessible Red Cedar Tree remaining in north Queensland and possibly Australia. This Red Cedar is claimed to be the largest in the Southern Hemisphere. They were formerly common in the Illawarra region in New South Wales to the McIlwraith Range on Cape York Peninsula, growing in most rainforests on fertile soils. They also occur in New Guinea. Their leaves turn yellow in winter and drop off, but within weeks the new pink shoots will have appeared. They can be grown in full sun if given adequate moisture, fertiliser and protection from heavy in the first 2 years. Many of these trees are now being planted privately for reforestation. Seeds can be gathered in December or January as the capsules begin to open and germinate within 2 or 3 weeks. A majestic tree, it is well worth the short drive from Chambers Wildlife Rainforest Lodge into the Gadgarra forest to view this awesome specimen that is considered a soul survivor of a time long gone, when these Red Giants dominated the forests of the Atherton tableland. To get to the Giant Red Cedar turn left out of the front driveway and then first left onto Winfield Road. Continue on for 2 km (avoid going down Day Road) to the crest of the hill where you turn right onto a dirt road and follow the road signs to the Giant Red Cedar.